1900 - The decades before and after 1900 were a period of enormous transformation in the physical locations of Americans. Demographers typically distinguish two modes of living: urban and rural. In plainer language, people live in the city or they live in the country. Throughout the nineteenth century, the United States had been mostly a nation of farmers, who lived in the country. Indeed, immigrants came to America seeking land that they could farm. In 1880, when a new wave of immigrants began to arrive in the United States, they moved to American cities, not to the countryside as immigrants had for 250 years. Immigrants took jobs in the new industries in the new cities: Polish farmers became steelworkers in Pittsburgh; Serbian farmers became meatpackers in Chicago; Russian Jewish farmers became tailors in New York City’s garment district; Slovaks assembled cars in Detroit; Italian farmers found jobs in Baltimore factories. 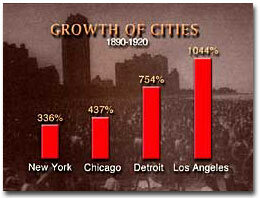 The cities grew at a fabulous pace, some of them doubling in size every decade. By the 1920 census, the urban and rural populations were equal in size, but the rural share would continue to drop for the rest of the twentieth century. Cities became the location of most of American life: politically, culturally, financially, and economically, the action moved from the bucolic countryside to the crowded, filthy city streets.